The Mid-Atlantic's Biggest Rock Festival features over 60 bands performing on four stages, plus outstanding barbeque offerings in the Pig Out Village, and top-notch camping facilities. 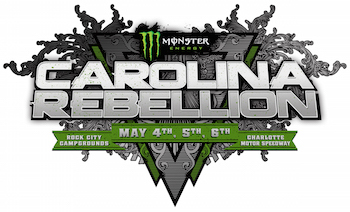 In 2017, Monster Energy Carolina Rebellion had another record-breaking year, with more than 105,000 fans attending over three days. 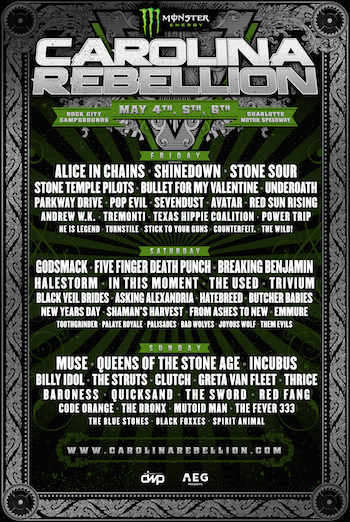 Joe Litvag, Executive Producer of Monster Energy Carolina Rebellion, said, "In all of the Carolinas there is only one music festival that has this kind of variety in a single weekend, spanning the rock spectrum and the decades of rock history. From Muse, Queens of the Stone Age, and Incubus to Five Finger Death Punch, Godsmack, Shinedown, Halestorm, and Alice In Chains, Breaking Benjamin, Stone Temple Pilots…it doesn't stop. And that is exactly what we wanted to accomplish for this year's Carolina Rebellion—non-stop, incredible rock from a diverse range of top artists." Brent Smith of Shinedown said, "We are extremely honored to be playing Carolina Rebellion 2018. We have always admired how this event has grown year after year. With that being said, let's get it on. Cya in May, Rebels!!!"